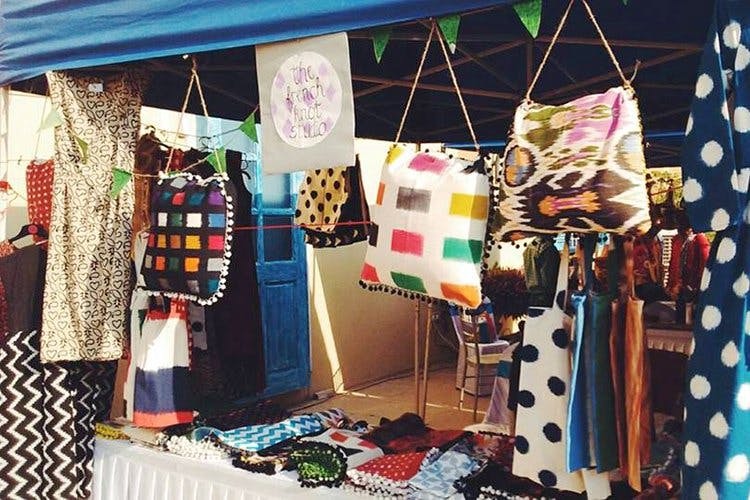 Hyderabad-based The French Knot Studio could be any ikat lover’s paradise. From home decor to personal accessories, you’re in for some textile fun! Ikat, usually associated with simplistic, classy styles, gets a quirky twist at The French Knot Studio, started by Kamini Krishnaraj. The store houses hand bags, home linen and Indo-Western outfits where a variety of ikat styles have been explored and quirked to perfection. Tea-length polka dotted dresses, short frocks in empire silhouettes, casual anti-fit ones for summer and very interesting kalamkari dresses are what we’re going gaga over. Totes in colours of the Rubik’s Cube that you can store your whole world in and small clutches for those short walks in the neighbourhood, these ikat bags can totally amp up your style quotient. And if you’re obsessed with ikat like we are, they have a gorgeous collection of home linen including cushion covers and ikat coasters that will immediately add a touch of class to your beautiful home. Their table runners feature block-printed Mughal floral motifs and table mats are in hand-woven in ikat. A burst of colours, some pop, some subtle, and a few in monochrome, these absolutely eye-catching designs will fill your soul. Box-pleated dresses in handwoven ikat and handloom cotton, machine-embroidered tank tops and heart block prints in vegetable dyes are among the cool finds here. They’ve also reinvented and given the little black dress a fresh twist by creating something called the little lace dress — very prom, very chic. But what we love most is one of their dresses made out of double ikat, a rare Indonesian technique. We also love that they’re a cruelty-free brand and believe in using sustainable methods. If you love ikat as much as we do, check out The French Knot for a quirky, chic and very different take.